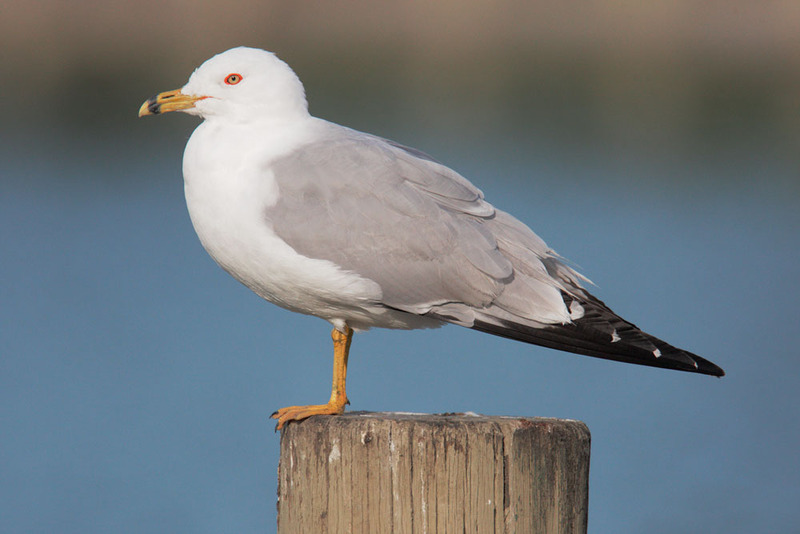 A small gull, the most abundant gull over much of North America, nests inland, and even in winter is found more often somewhat inland than along coast. 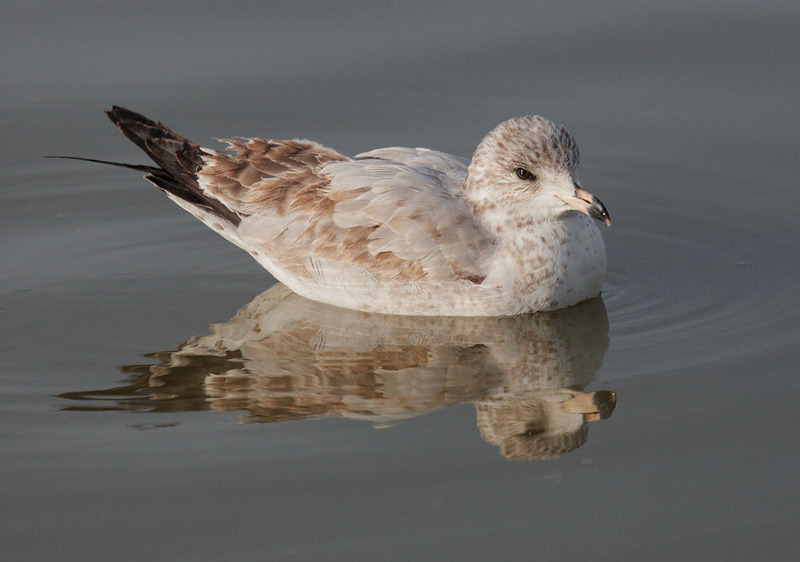 Most similar to the Mew Gull but larger, with lighter-colored eyes, proportionally larger bill, and distinctive dark ring around bill. 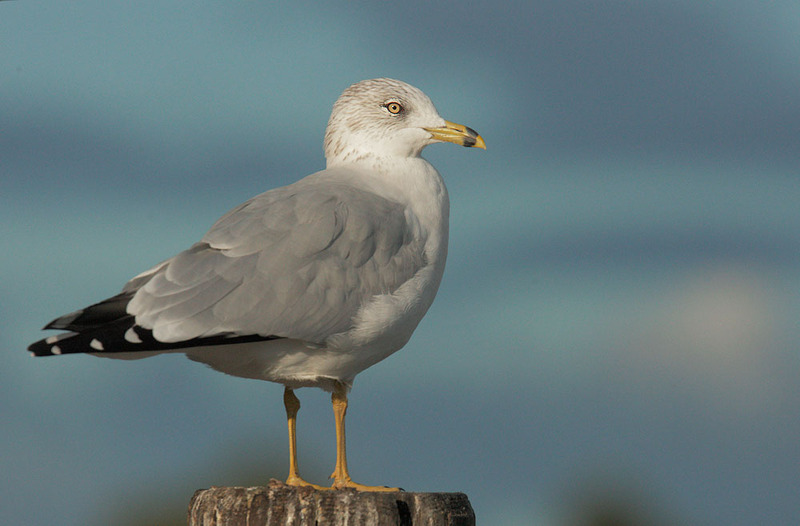 Similar in plumage and eye color to the distinctly larger (and also widely distributed and common) Herring Gull . 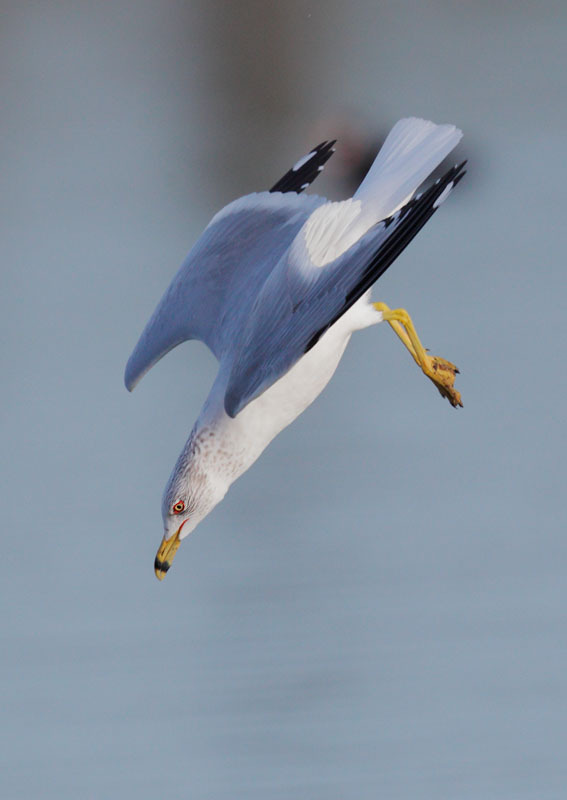 Above and below, the breeding plumage, with pure white head, and red orbital ring and gape. 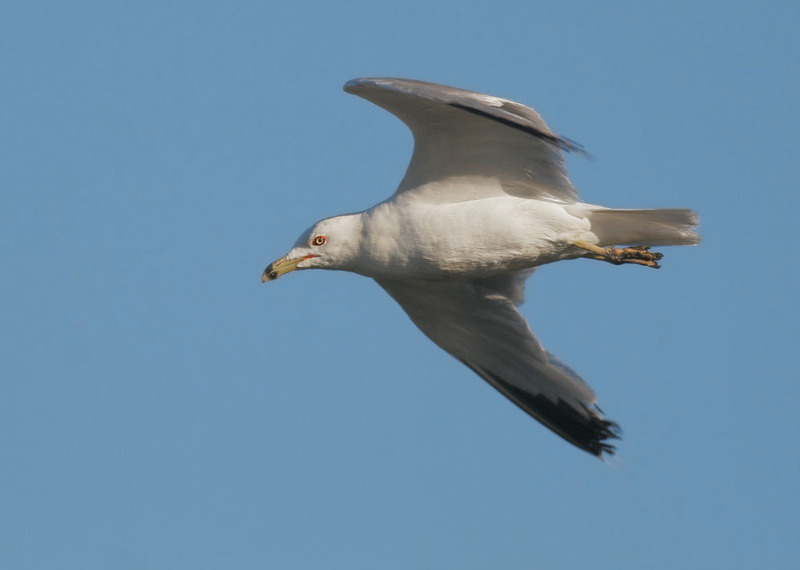 Above and the three below, Ring-billed Gulls in January with the breeding red orbital ring and red gape already developed, but with the brown markings of non-breeding plumage still evident on the head. 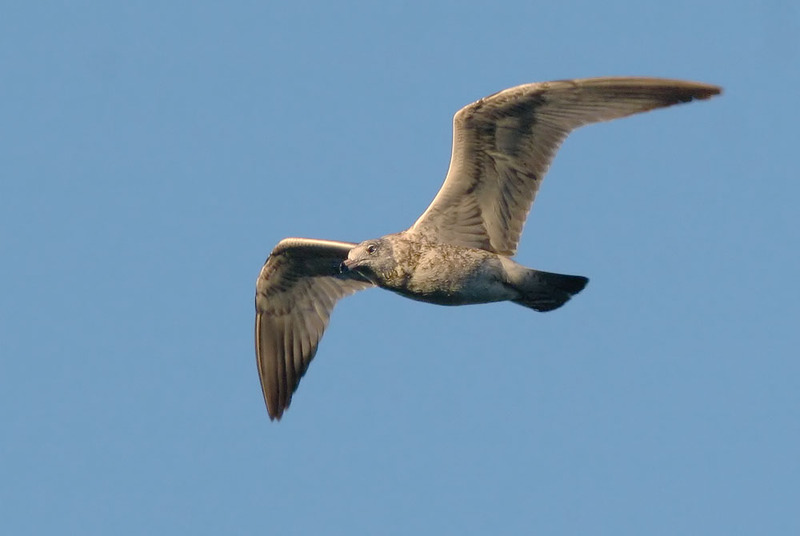 The molt to full breeding plumage can be complete by late February, as in the bird at the top of the page, and breeding plumage can also be seen in the Bay Area on early-returning migrants in July. 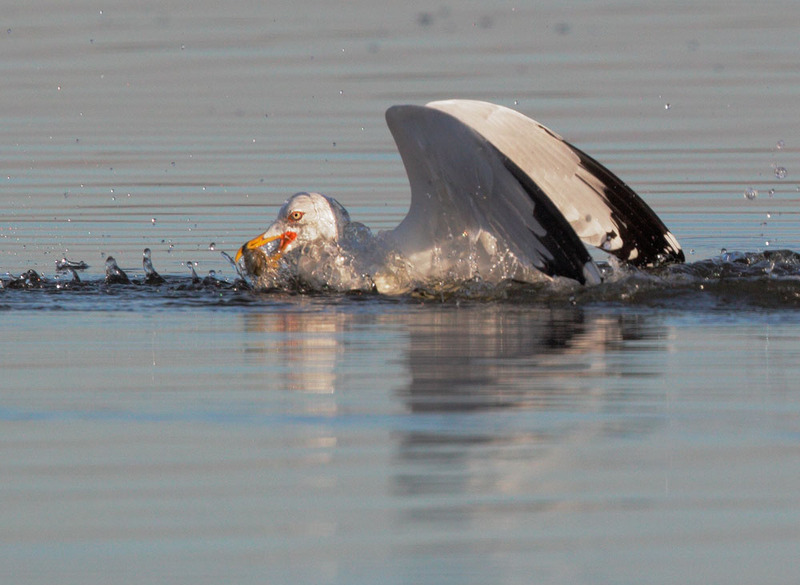 Above and below, two photos of a pair formed and bonding or courting in January. 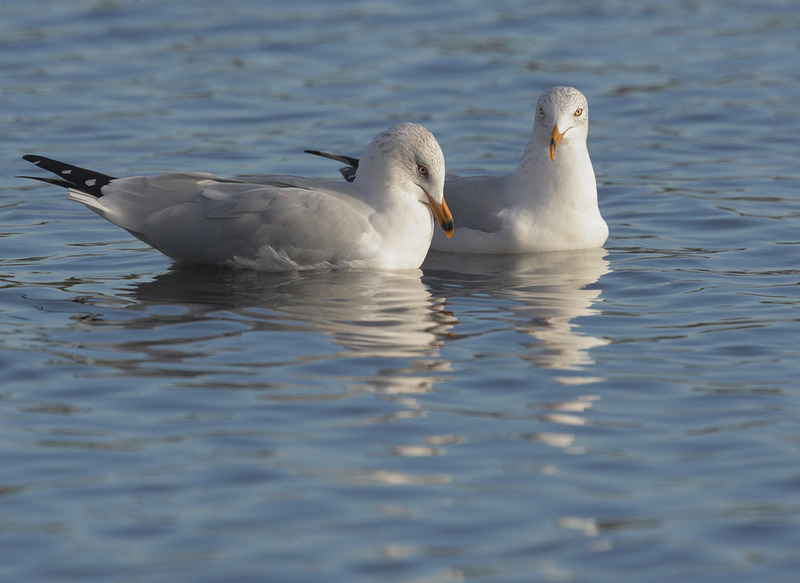 This pair was wintering here as do many birds of the species, and would migrate to the nesting grounds as a pair; Ring-billed Gulls do not breed in our area. 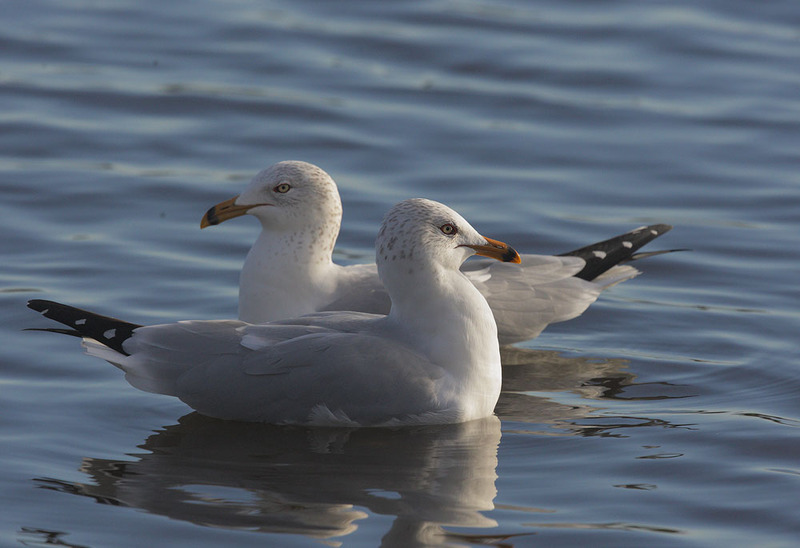 Above and the two below, adults in non-breeding plumage, a very common sight in winter throughout my area. 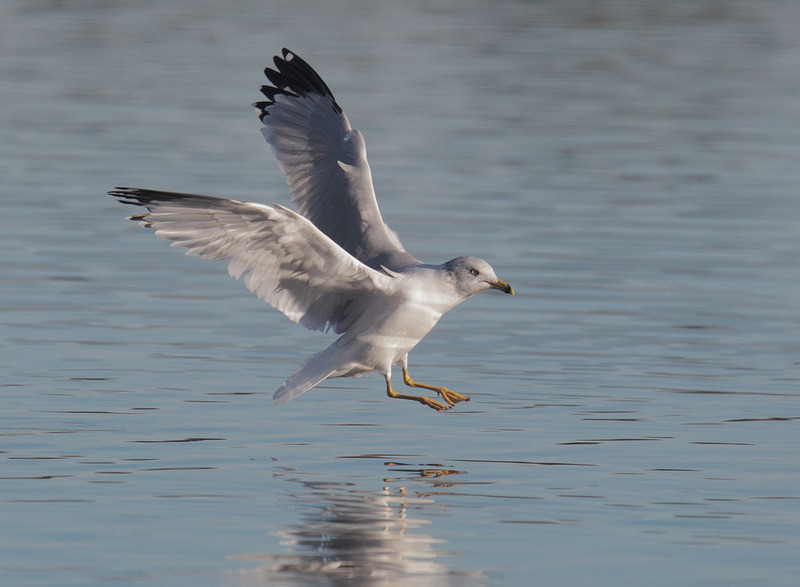 rather than yellow iris, identify the bird shown above as in its second cycle. 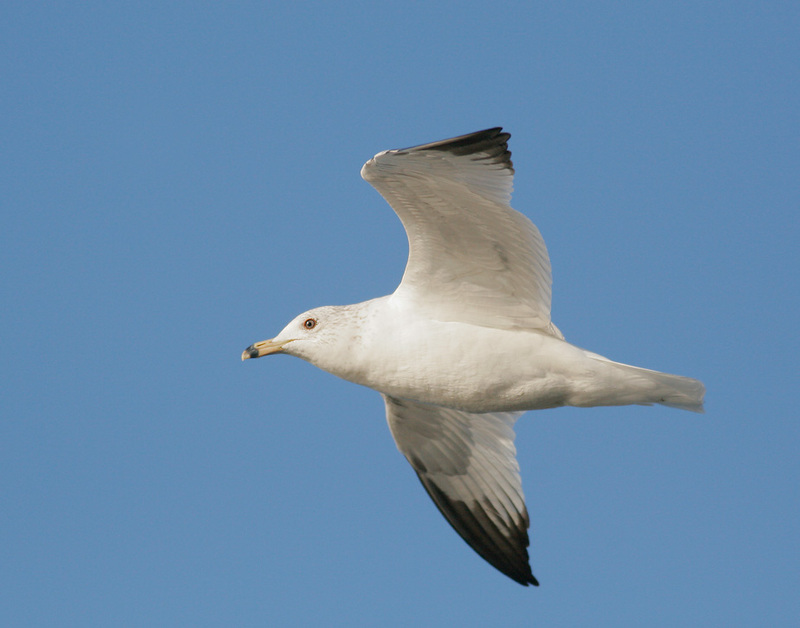 Most second-cycle Ring-bills retain some traces of a black tail-band, but some, like this one, have an all-white adult tail. 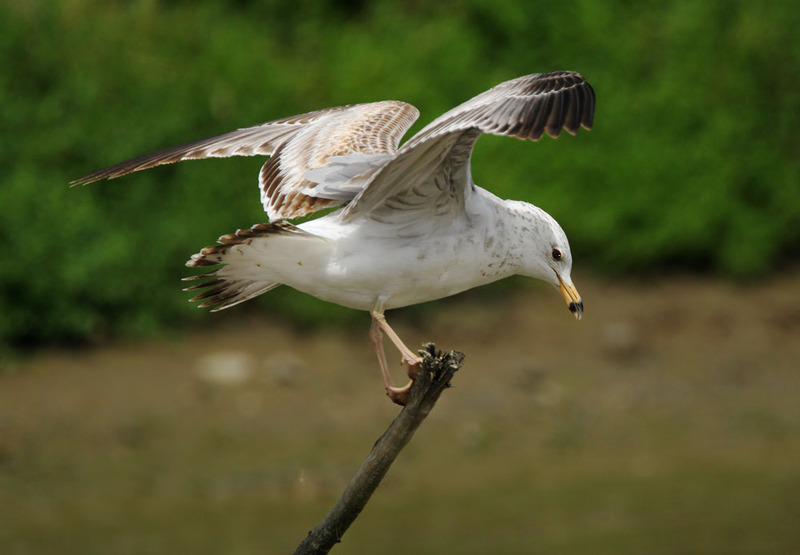 Ring-billed Gulls are adult at the end of their second cycle. First-winter birds, above and the next two below. 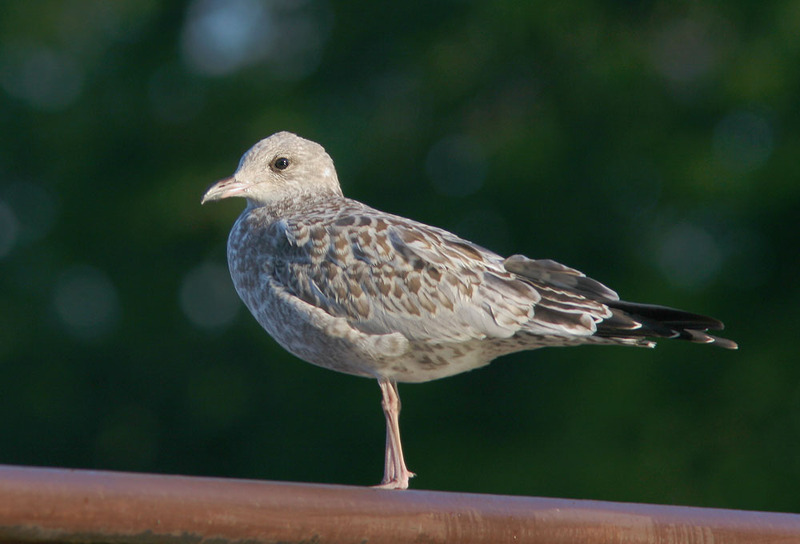 Adult-type pale gray mantle and scapulars growing in over the scaly brown juvenile-type wing plumage, sharp division between yellow base and dark tip of bill. 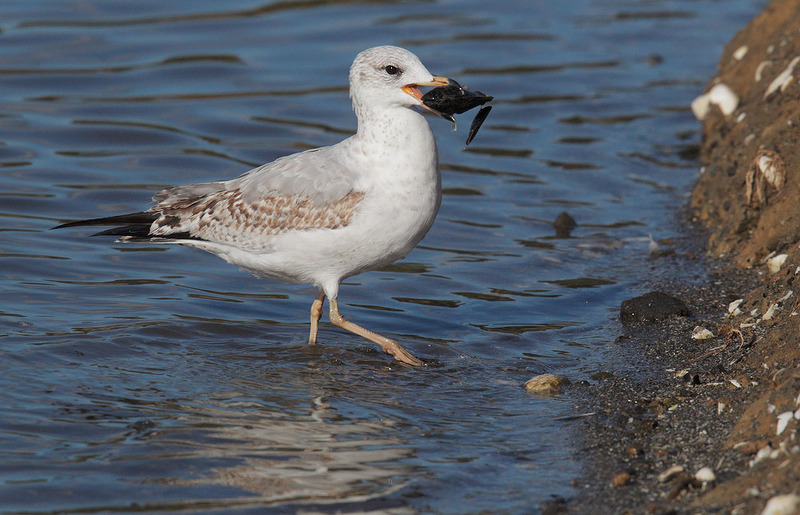 Dark brown terminal tail band; dark ring on bill starts to develop in many birds, as yellow appears at the tip. 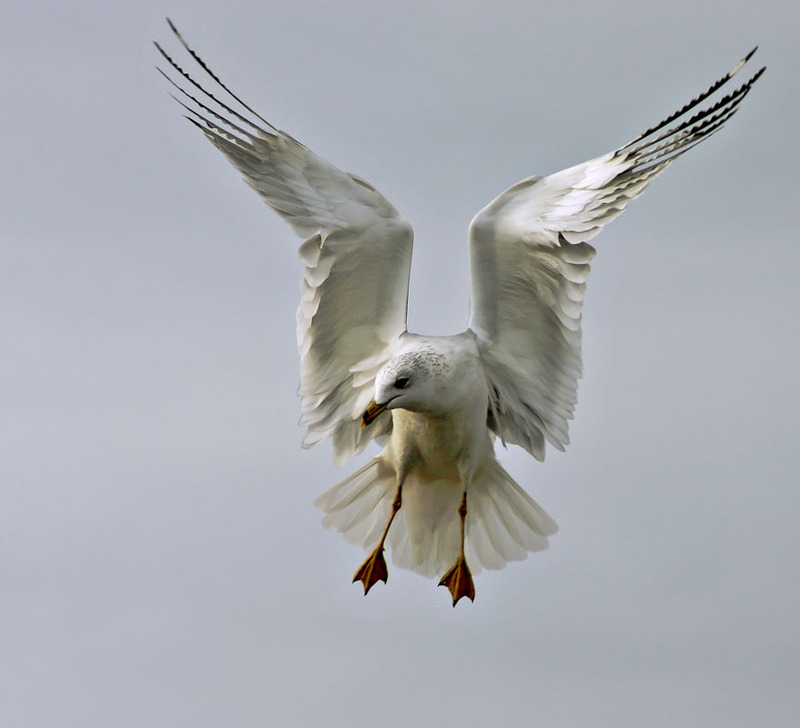 Note, this bird is photographed at the end of April, late in the first cycle. Juveniles, above and below, photographed in southern Ontario in July, within the nesting area of the species.